Two men have been arrested after a man who called police to report his vehicle had been vandalised died 10 minutes later when he crashed into a bollard. 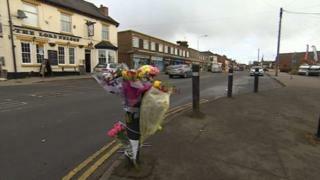 The driver, in his 30s, was pronounced dead at the scene in Wood Street, Earl Shilton, Leicestershire, on Saturday. He had been staying at the nearby Travellers Inn with his partner, said the hotel manager. The arrested men, aged 19 and 32, were held on suspicion of criminal damage and released while inquires continue. Police said the crash happened at about 23:00 GMT and they received a report of criminal damage to a green Rover Metro in the car park behind the hotel about 10 minutes before. Officers are continuing to appeal for witnesses who saw the crash, or the car before, to contact the force.